Fitness For The Rest of Us: Jill Yoga ~ Super Comfortable, SUPER Affordable Activewear. Sizes from 6 Months To Ladies Sizes! Jill Yoga ~ Super Comfortable, SUPER Affordable Activewear. Sizes from 6 Months To Ladies Sizes! I'm super excited to share the news about my latest favorite workout wear: Jill Yoga! Available for girls (the line starts at six months!) and women, Jill Yoga features stylish, high-quality activewear at a reasonable price- finally high quality workout wear that wont break the bank. This is SO rare in the activewear industry. Before I discovered Jill Yoga -it was either cheap price for cheaply made or spending a fortune & hoping it was high quality. I really love that they offer super adorable workout wear for the little tykes and us adults! They even have Mommy & Me sets, perfect for any active mother daughter duos out there! Perfect for back to school shopping! Keep reading to learn more and get ready to do some shopping, I know you will love the line as much as I do! They say the family that works out together stays together- we know they stay healthy together and of course have fun doing it. There’s nothing more fun than family fitness together, Jill Yoga lets you celebrate fitness and empowerment with matching mommy and me activewear, also perfect for aunt & niece workout partners (ME!). Exercise is a great way to spend quality time with your little ones and helps make working out fun while instilling good habits in your kiddos. Why not do it in the vibrant, bold colors and styles of Jill Yoga while stretching outdoors, playing in park, or warming up with yoga or a 5k together. Sizes start at six months old! 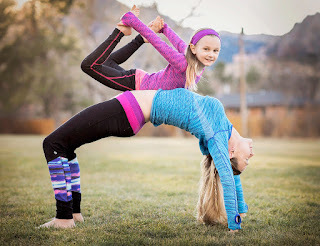 Adorable and affordable, Jill Yoga let girls and adults feel fit, active and confident in comfortable, trendy designs that feel good outside and in. Made from the highest quality of activewear textiles that conform and stretch with every movement, Jill Yoga outfits are available at great prices, which makes sweating in style easier on the family budget. I love the high quality fabric, fun designs, great fit, and wonderful stretch of the Jill Yoga pieces I had the pleasure of reviewing. The fabric is super soft- like really soft & comfortable. The leggings are not thin or see through. They are high quality & thick and I know they will last me a long time. Jill Yoga's mission is to promote confidence and healthy active living — Be Active, Be Bold, Be You. No matter what your own unique shape, girls and women will feel comfortable and confident with Jill Yoga activewear, making it a wardrobe staple everyday and everywhere. Mix and match from a wide range of jackets, tops, shorts, and more for ages infants and up! Available in a wide range of sizes for kids & adults and super fun, hip prints like galaxy and multi-colored leggings! From sports bras, tanks, shirts, pants, capris, leggings, and jackets and more! Check them out. I had the pleasure of reviewing their SUPER cute and SUPER comfy Ladies Scooped Raceback Tank and the Ladies Galaxy Print Capri Legging (pictured below). I am LOVING the galaxy prints in awesome colors. The waist band is wide so it doesnt twist or turn when you are exercising or lounging. The waistband doesnt pinch so I dont have to worry about muffin top and I can stretch it up to cover any love handles or fold it over for a lower fit. Jill Yoga has coordinating tops, bottoms, and jackets so its easy to put together a cute outfit. I have gotten a TON of compliments on my outfit featuring the galaxy print. I could seriously sleep in these -they are that comfortable. Available in sizes small to XL for ladies and I found them true to size. I got large in both & they both fit perfectly.